If you guys would like to give me some QoL/small updates to work on, I'll focus on the stuff posted here for the next update. RuneLite has been updated and includes new features such as fog and skyboxes. Blood and souls runes can now be runecrafted using pure essence. Use the Great Kourend Runecrafting teleport under skilling to get started. Blood runes provide 10.5 XP per rune, and soul runes provide 11 XP per rune (rates pre any kind of boosts). Added the adamant and rune dragon task extension slayer unlocks. Kree'arra will now also use melee attacks if you aren't attacking back. The dark relic can now be exchanged for experience. Tournaments will now remember the last 4 modes to avoid repeats (except for 4 PM - the bond tournament). Increased the chances of a dragon impling spawning. Attacking a player/monster (but not being hit yourself) will no longer apply a logout delay. Prayers can now be changed while actions are locked (such as while teleporting). Equip models for PvP weapons now use the correct OSRS versions. The looting bag can now be opened to deposit items picked up directly into the bag. The rune pouch option when saving loadouts will now default to off if you don't have the pouch in your inventory. Raids scavenger runts have been replaced with scavenger beasts. Increased the XP given by wyrm, drake, and hydra bones. Increased the strength bonus of the serpentine helm to +5. The clue scroll team capes have been added to the team cape shop. Increased the drop rate of PvP weapons from revenants and wilderness bosses. Your defence level now be reset at the cost of 1M coins. The game will better keep any capitalization in your username. Krystilia will now cancel wilderness tasks for 30 points. Fixed drop rate boosts not applying in Raids. Fixed an issue with custom tournaments providing less than the correct quantity of the prizes. Fixed the text on the tournament interface. Fixed the seed box empty/check options. Fixed clicking the tile you're standing on not canceling combat. Fixed loadouts not adjusting your rune pouch. Fixed your saved default bank quantity not correctly displaying when relogging. Fixed a safe spot in the deep wilderness dungeon. Last edited by Palidino; 02-08-2019 at 07:22 PM. Shift+left click drop would be amazing. 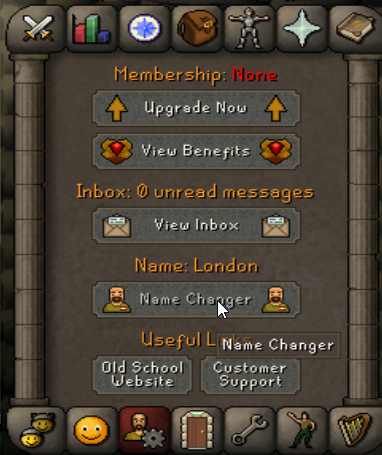 This button should link to the correct forum link to request a name change. Given everything posted either was added in the last update, is being added this update, or wasn't possible/the community wouldn't support, I've cleaned up this thread. Back to it though! Please fix trident uncharging. Currently if you uncharge a trident, you lose all the items that went into it. Last edited by carlst; 02-08-2019 at 07:16 PM. Please Add Corrupt/Non Corrupt Pvp armour, For mains and 20+ defence players ( Corrupt ) Thanks! love the stuff, especially prayer flicking & def resetting!